Wally Boyd from Denise Swanson’s New York Times bestselling Scumble River mystery series talks about his honeymoon. Hi! My name is Wally Boyd. My new wife, Skye, and I wrapped up an investigation last night and we’re now ready to start our honeymoon. Back home in Scumble River, a small town in Central Illinois, I’m the police chief, but for the next week, my only job is to enjoy being married. I’ve been attracted to Skye since she was sixteen, but considering that I was twenty-four at the time, I never told her, or even admitted it to myself. Still, it was no surprise that when she returned to town seven years ago, I found myself falling for her again. Unfortunately, although she was now twenty-nine, I was married to somebody else. So once again, I kept my mouth shut. Finally, after my wife dumped me and Skye broke up with the guy she was dating, I made my move, and now we’re ready for our happily ever after. Because, as we say in my home state of Texas, I just love Skye to death, I surprised her with a luxury suite on a Caribbean cruise for our honeymoon. I got a really good deal because the travel agent had some sort of large group booked on the trip, but I would have gladly paid full price to make her happy. And considering who Skye thought she saw on the staircase when we were waiting for the elevator, I probably should have. I sure hope our ship isn’t crawling with folks from our hometown. While I like my fellow Scumble Riverites, I don’t want to share my honeymoon with them! On the other hand, as long as no one gets murdered, I guess the rest doesn’t matter. Keep your fingers crossed that no bodies turn up, because although I can resist investigating a murder during my honeymoon, I’m pretty dang sure Skye won’t be able to keep her nose out of the case. Now come on Wally, you know Skye can not go an entire week without finding a dead body or being wrapped up in a murder mystery. You poor man, not even your honeymoon will be I eventful. Wally, I just know that Skye will bump into a dead body. Silly man, but think of the fun you'll both have solving this crime together. Running into a dead body just can't be helped sometimes. Just pre-ordered your new book. 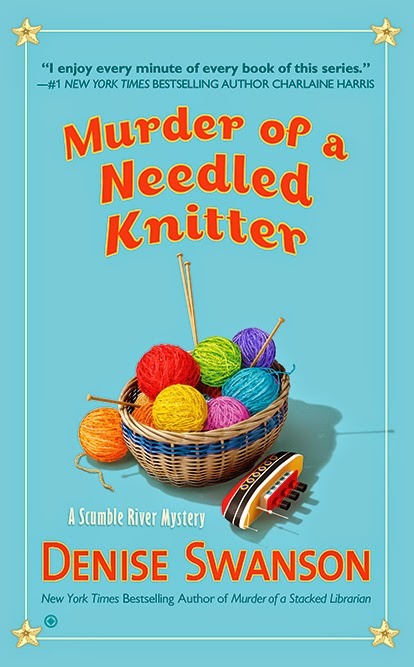 I absolutely love your Scumble River mysteries! You are one of my favorite cozy authors. Thanks for many hours of happy reading!